Good morning and blessings from Casa De Gillette. Pam and I have truly enjoyed our 2 weeks off from Nicaragua but we are ready to get back to work. Today we will return to Nicaragua refreshed and renewed. I learned yesterday that as of today the Kroger cards that are linked to BWCM will no longer be usable. Kroger has started another program called “Community Rewards” that will link BWCM with your Kroger plus card. I have filled out the paperwork and will let you know when its time to register you Kroger Plus card. You will have to go to Krogers web site and register your card. I’ll send out another letter as soon as I hear from Kroger. Monday we will begin out 10th year of Manna Fest. For those that are new to the program its an opportunity for you and your church family to purchase food for the families in Nicaragua that will be given out during Christmas. We can feed a family of 6 for a week at a cost of $10.00. I also wanted to share with you a video that was done by Bedrock Community Church about their week in Somottillo. Be Blessed and have a great weekend. followed him. (His dad Scott Swedenburg would have done the exact same thing.) Samuel Leonard is our secret weapon. He has been a hitting machine. Our engage team has been doing an outstanding job!! I found out today that Ross Page has been given the task of keeping the pigs off the property. He is doing a great job!! Boyd Kaiser is the newest member of team BWCM soccer. I have heard they call him "Dominator." God is really using this time in everyones life to sharpen, shape, and challenge. I was reminded tonight about a passage I have been in for a few weeks now. 2 Corinthians 1.3-4 3 Praise be to the God and Father of our Lord Jesus Christ, the Father of compassion and the God of all comfort, 4 who comforts us in all our troubles, so that we can comfort those in any trouble with the comfort we ourselves receive from God. This week is NOT about baseball. It is ALL about Jesus. I remember a story on Dawson Student Ministry (High School) Chapel Choir trip. We were able to spend an afternoon at a Mens recovery center (a Farm Center.) We had the opportunity to take a tour of the Farm. A man who was recovering from some type of addiction drove us around on a tractor and told us all about the programs and the different types of "jobs" each man had. A story he shared really stuck with me. He shared with us at first he didn’t really understand some of the tasks the leaders would give him. He knew he could do it a different way and possibly achieve the same results and may even be done faster. What he had to learn was, that it was not about finishing faster or doing it a better more efficient way, but it was about following directions and allowing himself to be led. That night that man shared something that didn’t really impact me too much on the trip, but it has made a huge impact on myself and a few others on the mission field. Everyday our Lord is teaching us and grooming us to do great things. I truly believe this week has already been full of teaching moments. As a believer, He is asking us to be teachable, moldable, obedient, and most of all, willing. Last night during "God Moments" someone made the statement "it is not something that happens over night." I quickly thought of the word methodical. I have had the privilege to call Francisco Leonel Osejo my friend. As bad as I wanted him to come to know the Lord three years ago. I have been able to see God work in his life. Yesterday after his team defeated us, he asked if he could share first. Something you need to know first: Four years ago Somotillo men would not give us the time of day, much less share anything in public with their "guy" friends around. He stepped up and wanted to share before we had a chance to share with his team. He first thanked God for giving both teams a chance to play a great game. Then he shared how thankful he was that we were being obedient and following the path God has laid out for us. For three years I have often wondered is For Love of the Game really building up the kingdom???? Are we connecting with these guys. The Lord used yesterday and today to teach me. It is ALL about the small things. It is truly about loving people. Scripture tells us to love Him with everything we have and love our neighbor in the same way. The game of baseball is a great game. It is a wonderful tool. A year ago this week I received a message from my wife Marsha Hall that she had a miscarriage. I was thousands of miles away and she was without me. I woke up today thinking about that. The Lord used my friend Francisco to comfort me as I have often comforted him. He followed us back to Casa De Shelly and hung out. We introduced him to a game called Spike Ball. He stayed and played for a while. The whole time he was playing I was smiling and thanking God for allowing me to be a part of this great moment. He used Francisco to comfort me today. As my heart started out clouded with hurt, The Lord used a friend to fill it with JOY! It is not about how BIG you do it or how many people show up. It is all about what you do with the people God places in front of you. We must remember we have all been created with a purpose. We are a well thought out plan. The key to our success lies in our obedience to our Savior. Another Great Day on the Mission Field. Blessings from Somotillo Nicaragua…..I wanted to take a minute and bring you up to speed on all the Kingdom Building that has been taking place over the past couple days. Our two teams have come together very well and God is using each one for HIS glory. The past two days the ladies have gone to Esperanza and El Platenal to hold "women’s bible studies." The men poured the concrete floor in one house in Pascula, painted the outside of the same house and dug footings for a new house. Afternoon village ministry has taken us to Laredo yesterday and San Francisco today. Its been exciting to watch GOD stretch our team beyond anything they could have imagined. Thankful that GOD put together a team from Huddleston Community and Grace Fellowship to support each other this week. Huddleston has been coming to Somotillo for 10 years and most of the group has been here many times. The team from Grace Fellowship is making their first time ever mission trip. As of today you would think they all go to the same church. GOD IS AMAZING!!!!!! Blessed to see several come to know Christ as their LORD, thankful for the medical provisions as well as the food that we have been able to give out each day. After arriving safely at Casa de Shelley, we unloaded and settled in and headed out to a village called Esperanza. Our whole team engaged the kids in games, sports, and story telling. 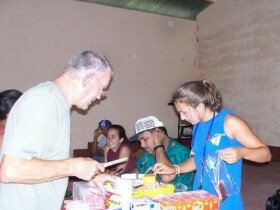 After serving the meal, there was a worship service held under the village’s shelter that was built by BWC Ministries. At that service, one woman who the BWC team has gotten to know over the years prayed to receive Christ. That evening, we went to Principe de Paz for their Sunday evening service. We heard a missionary from Tennessee preach and had a great time of worship. We went to the radio station both Monday and Tuesday morning, where Tim, Lisa, Abby, Jay, Sarah, Josh, and Dr. Williams shared their testimonies, some of them sharing testimonies for the first time. We also spent both days in the village of La Puma with the medical team setting up in the school and the engage team outside in the yard. Over the course of two days, the medical team saw about two hundred people. While the medical team was treating, the engage team was playing soccer, Frisbee, dodgeball, painting fingernails, coloring, and playing yard games. It was very special to the team members to be able to spend two days with the same kids and build relationships with them. It also made leaving this afternoon very hard knowing we would not be returning to that village on this trip. While in La Puma, we saw two people come to know Christ. On Monday, a man named Michael who had been playing Frisbee with our team and the kids came up to some of our team members after they shared the Gospel. He believed in God but wanted a better understanding of a relationship with Jesus. With the help of our interpreter Roger, Michael prayed to receive Christ and is excited about getting involved with Principe de Paz. Today, Michael’s wife Sonia was being treated by Alex, one of the doctors on our team. In his conversation with Sonia, he also was able to share the Gospel and pray with her to receive Christ. It is so awesome to see how God has moved in one family over our two days in La Puma. We also engaged another young man named Frank who we will continue praying for faithfully knowing that the Holy Spirit is moving in his life. Miss Pam was able to share the Gospel on Monday but he was not ready to receive it. Dr. Don and Dr. Bill left Monday morning to travel to Honduras for pastor training and returned safely Tuesday afternoon having spent two great days training young pastors equipping them for ministry in their churches. So much has happened in these first two days, it makes us even more excited for what God will do over the next three. Please be praying for our medical and ministry team. This morning was the last day for the Bethesda team on the compound before heading back to Managua. After breakfast they headed up to the Mountain of prayer! Lets just say being on the Extreme team is not in their near future but, they all made it up and back safely with just a few scratches to show for it. Then they headed for the Pacific Ocean to engage some of the kids of Corinto through a block party. This is where Roger, one of the wonderful translators and helpers this week lives. On the way back to Somotillo, Donald treated the team to an American treat, Burger King. In the afternoon the team headed to their last village visit, the village of Pascuala. Here they engaged with the village community by painting nails, handing out packets, playing sports, making balloon animals, and sharing the Word as much as possible. An amazing scene was when two members of the team , Chase and Phil, took the shoes off their feet to hand to two boys in the village that the Lord led them to help. What an amazing site of Gods love and a servant heart. This team has had a great week , full of many memories and experiences that they will never forget. They are sad to leave, but look forward to sharing all they have accomplished and all that the Lord has laid on their hearts with their friends, family and home church. Que pasa amigos?Team Bethesda began today by heading to Principe de Paz radio where Hannah, Logan, and Phil/Peter shared their testimonies. Then we headed out to San Francisco to pour the footings for the new church structure we are building there. It was a great show of teamwork as team members split up. Some engaged, prayed with, talked to, loved on the villagers while others did the manual labor. Some villagers even jumped in to help with the cement pouring. It was great to see those people sowing the seed of their own spiritual community. Five teenage girls chose to accept Jesus into their hearts as well. After coming back to the Casa to enjoy another wonderful meal from Mama Maria, the team headed out to Casa Blanca (aka White House). 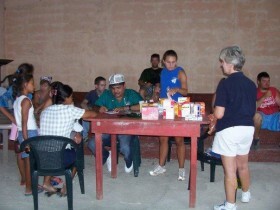 The team again worked together to provide food, medical care, clothing, and love to the community. 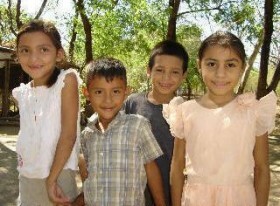 Doctor Carolina saw 55 children, and many children received clothing they really needed. Alice, along with other team members, led a clever skit to share the Parable of the Prodigal Son (Luke 15). The distribution ministry went wonderfully since Bethesda brought such an abundance of items to bless the people of Nicaragua. We’re looking forward to a great night of God moments and a few more days working as the hands and feet of God here in Somotillo. We are always thankful for your prayers. Hello again from Somotillo! Today was our team’s (Bethesda Baptist Church) first full day out on the field. After unpacking and some quick debriefing, the team set out in the morning. A few members travelled to the local radio station to tell their stories of salvation, and sing a few songs. Upon their return, we all left for our first village, San Francisco. This is the village where our team, and other teams, have begun constructing a church building for all of the village to come to. The land was already cleared by the previous team that came through, so our job for the day was to start digging the footing. After a couple hours of hard work and play with the locals in San Francisco, we left for our second village of the day. The best part of riding in the trucks between villages is definitely being able to pass out candies, clothing, and other items to the eager hands running beside the trucks. Working is good, and being able to share food with the hungry villagers (and team members) is great, but the main thing I personally love about being here; is being able to put a genuine smile on a person’s face. A little piece of candy, a shirt, or even just waving, makes a person’s day infinitely better. And the best thing about being able to brighten someone’s day; is that you don’t have to travel around the world to do it. The people in Nicaragua need constant help and attention and indeed the laborers are few, but that should not stop us from being on mission in our own communities while we wait to be sent out. Smile, wave, tell someone they look good today. I’ve learned in my short time in Nicaragua, that it can be the littlest things that count the most. God has blessed us all, now it is our turn to share those blessing with the people close, and not so close, to us. Hello from Somotillo, Nicaragua! Today was another spirit filled day full of God’s glorious grace and presence! We went to a village called La Palma, which had only first been visited by North American missionaries two weeks ago. It was about a two and a half hour drive from the Casa, taking us through some of the most beautiful terrain on God’s green earth. The mountains, the valleys, the rivers; it was all so breathtaking. The mission team passed through several small villages on the way to La Palma where we threw candy and some supplies. The real beauty today was the willingness of the team to spread the Gospel regardless of the difficulty of delivery. We were able to see God today and watch him breathe truth and life in to our souls by reaching a seemingly unreached people. The praise team worshipped with the locals and the mission team worshipped with prayer and sharing a meal with the locals. In return many responded to the call of Christ, and it was certainly a beautiful experience. Earlier this morning a few of the team members were able to share testimonies and songs on the radio again. It was a great experience because it is a way that we can audibly share what God has done in our lives. Hearing of a changed heart, and a changed life, is one of the most beautiful stories we could possibly listen to. It is awesome to consider how Christ is able to use the filth and struggles of our past, even things we are ashamed to admit, to encourage other people that He can help them out of their own sin and trials. No one’s story is the same, but we have all experienced pain and trouble, joy and victory, and there is power in sharing what Christ has done in the chapters of our lives that have come to a close. Another incredible day on the mission field! God continues to amaze us with his grace and goodness. Mike, Ben, and John continued to teach and train the local pastors from the Somotillo area during the morning. The rest of the team learned how hot it can get while doing hard work. We began by taking a dump truck out to a place on the main road where the rain had washed the bank away the night before. Upon approaching the recent landslide our hearts began to sink as we felt the truck slow down. This was the beginning of our exposition to the Nica way of highway cleanup and debris removal. One of our translators, Roger, jumped out with several shovels, 5 gallon buckets, a pick and mattock, and a digging bar. We hauled two loads of dirt for leveling the floor at the community building we worked on yesterday. After doing some grading work at the building site we loaded up and went back and had lunch. After lunch we went to the village of Los Jovitos and prepared food, played with the village children and had an opportunity to share the gospel. There were four men who flagged down two people walking around the village from the mission team and began speaking to them. The young men quickly found a translator to interpret between the missionaries and the locals. The translator informed the two missionaries that they wanted to drink rum with them. They took the opportunity to share the gospel with the men and two of them accepted Christ. After breakfast this morning, the team split into two groups- with Mike, Jon and Ben staying at the compound to teach pastor’s school, and the rest of the team going out to La Barrera to begin laying block on the shelter. At Pastor’s School, Mike spoke about leadership, laying out the keys to leadership in the church as well as situational leadership. It was incredible to see the ways in which God is at work through these leaders- equipping them to lead their churches and helping their churches experience continual growth. During a break in teaching, Pastor Reynaldo spoke briefly about a 2nd location for Principe de Paz (1 church, 2 locations, 1 family), announcing that he will be pastoring the second location. In addition he introduced two new leaders, with one coming on board to serve as the pastor in Villa Nueva, and the other becoming the area missionary in the communities around Villa Nueva. It was amazing to see the new work that God is doing here in Somotillo. While Mike, Ben, and Jon sat in the air conditioning at pastor training (working very hard!!! ), the rest of the team returned to La Barrera to begin laying bricks for the multipurpose building that the Dawson team started constructing. The team worked together to gather bricks, get another load of sand, and lay the bricks Nica style. The team was impressive in battling the heat and in working together to do the job efficiently. There’s still much work to be done before the multipurpose building is finished, but we are excited to continue to see the fruits of our labor. This afternoon the whole group went to El Platanal for medical assistance, food, and games. They are digging ditches for a new water distribution system there, so the roads were bad, but it was good to see the infrastructure being expanded. Jones was offered a fresh bottle of water by one of locals (even though the water was not actually fresh), and it was a very moving thing. How great is a gift from one who has so little to give! God did great work with the team today. We’re looking forward to what we’ll see next!